George Frideric Handel (February 23, 1685 – April 14, 1759) was a leading composer of Baroque concerti grossi, operas, and oratorios. Born in Germany as Georg Friedrich Händel (ˈhɛndəl), he lived most of his adult life in England, and became a subject of the British crown on January 22, 1727. His most famous piece is the Messiah, an oratorio set to texts from the King James Bible (an excerpt of it is played by the chimes of the Houses of Parliament in London); other well-known works are Water Music and Music for the Royal Fireworks. He deeply influenced many of the composers who came after him, including Joseph Haydn, Wolfgang Amadeus Mozart, and Ludwig van Beethoven, and his work helped lead the transition from the Baroque to the Classical era. The circumstances surrounding the composition of Messiah stand as a legacy to Handel's Christian faith. Messiah was composed to be performed as part of a benefit concert. In the years after the "great oratorio" as completed, Handel, by conducting scores of performances of the work, raised substantial funds for such charitable causes as paying off the debts of people in debtors' prison and supporting a London hospital. Through these activities, Handel serves as an example of an artist who used his creative abilities for deeply altruistic purposes. Handel was born at Halle in Saxony-Anhalt to Georg and Dorothea Taust in 1685, the same year that both Johann Sebastian Bach and Domenico Scarlatti were born. He displayed considerable musical talent at an early age; by the age of seven he was a skillful performer on the harpsichord and organ, and at nine he began to compose music. 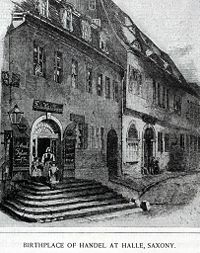 However, his father, an eminent barber surgeon who served as valet and barber to the Courts of Saxony and Brandenburg, as well as a distinguished citizen of Halle, was opposed to George Frideric pursuing a musical career, preferring him to study law, whereas his mother, Dorothea, encouraged him in his music. Nevertheless, the young Handel was permitted to take lessons in musical composition and keyboard techniques from Friedrich Wilhelm Zachau, the organist of the Liebfrauenkirche in Halle. His aunt, Anna, had given him a spinet (early harpsichord with a single keyboard and only one string for each note) for his seventh birthday, which they moved into the attic and he went there to play it whenever he could. In 1702, in obedience to his father's wishes, he began the study of law at the University of Halle, but after his father's death the following year, he abandoned law for music, becoming the organist at the Calvinist Cathedral. The following year he moved to Hamburg, accepting a position as a violinist in the orchestra of the opera-house at Hamburg. Here his first two operas, Almira and Nero, were produced early in 1705. Two other early operas, Daphne and Florindo, were produced at Hamburg in 1708. During the years 1707-1709 Handel traveled and studied in Italy. When opera was banned by local authorities, Handel found work as a composer of sacred music and wrote some pieces in operatic style. The famous Dixit Dominus (1707) is from this era. His Rodrigo was produced in Florence in 1707, and his Agrippina at Venice in 1708. Two oratorios, La Resurrezione and Il Trionfo del Tempo, were produced at Rome in 1709 and 1710, respectively. In 1710 Handel became Kapellmeister to George, Elector of Hanover, who would soon be George I of Great Britain. He visited London in 1710 and settled there permanently in 1712, receiving a yearly income of £200 from Queen Anne. In 1726, Handel's opera Scipio (Scipione) was performed for the first time; it included the march that remains in use today as the regimental slow march of the British Grenadier Guards. He was naturalized a British subject in the same year. In 1727, Handel was commissioned to write four anthems for the coronation ceremony of George II of Great Britain. One of these, Zadok the Priest, has been played at every coronation ceremony since. Handel was director of the Royal Academy of Music 1720-1728, and a partner of J. J. Heidegger in the management of the King's Theatre 1729-1734. Handel also had a long association with the Royal Opera House at Covent Garden, where many of his Italian operas premiered. Handel gave up operatic management entirely in 1740, after he had lost a fortune in the business. In April 1737, aged 52, he suffered a stroke or other injury which left his right arm temporarily paralyzed and stopped him from performing. He also complained that he had trouble focusing after the event. In August of 1750, on a journey back from Germany to London, Handel was seriously injured in a carriage accident between The Hague and Haarlem in the Netherlands. In 1751 he started turning blind, and by age 65 one eye was completely blind. The cause was unknown and progressed into his other eye as well. He died some eight years later in London, his last attended performance being his own Messiah. More than 3,000 mourners attend his funeral, which was given full state honors; and he was buried in Westminster Abbey. Handel never married, and kept his personal life very private. He left a sizable estate to a niece in Germany, as well as leaving gifts to his other relations, servants, friends, and favorite charities. 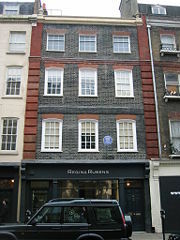 From 1723 until his death in 1759, Handel lived at 25 Brook Street, London as is commemorated by a blue plaque on the outside of the building. Here he composed Messiah, Zadok the Priest, and Fireworks Music. In 2000, the upper stories of 25 Brook Street were leased to the Handel House Trust, and, after an extensive restoration program, the Handel House Museum opened to the public on November 8, 2001. Next door at 23 Brook Street is another blue plaque for a more modern musician, Jimi Hendrix. Handel's compositions include some 50 operas, 23 oratorios, and a large amount of church music, as well as instrumental pieces, such as the organ concerti of which there are sixteen, including the Opus 3 and 6 Concerti Grossi, the Water Music, the Fireworks Music, and "The Cuckoo and the Nightingale," in which the birds can be heard calling back and forth to each other during passages played in different keys representing the vocal ranges of each of the two birds. After his death, Handel's Italian operas fell into obscurity, save the odd fragment, such as the ubiquitous aria from Serse, "Ombra mai fu"; his reputation throughout the nineteenth century and first half of the twentieth century—particularly in the Anglophone countries—rested primarily on his English oratorios, which were customarily performed by enormous choruses of amateur singers on solemn occasions. These include Esther (1718); Athalia (1733); Saul (1739); Israel in Egypt (1739); Messiah (1742); Samson (1743); Judas Maccabaeus (1747); King Solomon (1748), and Jephtha (1752). Since the 1960s, with the revival of interest in baroque music and original instrument playing styles, interest has revived in Handel's Italian operas, and many have been recorded and performed on stage. Of the 50 he wrote between 1705 and 1738, Alcina (1735), Ariodante (1735), Orlando (1733), Rinaldo (1711, 1731), and Serse (also known as Xerxes) (1738) stand out and are now performed regularly in opera houses and concert halls. Arguably the finest, however, are Giulio Cesare (1724) and Rodelinda (1725), which, thanks to their superb orchestral and vocal writing, have entered the mainstream opera repertoire. Also revived in recent years are a number of secular cantatas and what one might call secular oratorios or concert operas. Of the former, Ode for St. Cecilia's Day (1739) (set to texts of John Dryden) and Ode for the Birthday of Queen Anne (1713) are particularly noteworthy. For his secular oratorios, Handel turned to classical mythology for subjects, producing such works as Acis and Galatea (1719) Hercules (1745), and Semele (1744). In terms of musical style, particularly in the vocal writing for the English language texts, these works have close kinship with the above-mentioned sacred oratorios, but they also share something of the lyrical and dramatic qualities of Handel's Italian operas. As such, they are sometimes performed on stage by small chamber ensembles. With the rediscovery of his theatrical works, Handel, in addition to his renown as an instrumentalist, orchestral writer, and melodist, is now perceived as being one of opera's great musical dramatists. 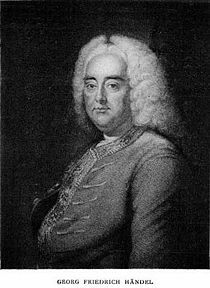 Handel adopted the spelling "George Frideric Handel" on his naturalization as a British citizen. His name is spelled "Händel" in Germany and elsewhere, and "Haendel" in France, which causes no small grief to catalogers everywhere. 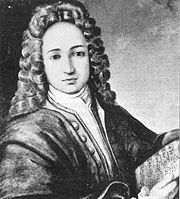 There was another composer with a similar name, Handl, who was a Slovene (without umlaut; not Händel). He was usually known as Jacobus Gallus. 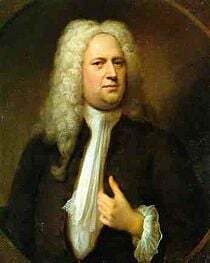 Handel's works were edited by S. Arnold (40 vols., London, 1786), and by F. Chrysander, for the German Händel-Gesellschaft (100 vols., Leipzig, 1859–1894). Messiah was first performed in New Musick Hall in Fishamble Street, Dublin on April 13, 1742, with 26 boys and five men from the combined choirs of St. Patrick's and Christ Church cathedrals participating. ↑ K. Adams Aileen and B. Hofestadt, "Georg Handel (1622-97): The Barber-Surgeon Father of George Frideric Handel (1685-1759)," Journal of Medical Biography 13(3) (Aug. 2005): 142-149. Abstract available online. Retrieved August 7, 2007. ↑ George Frederic Handel, Virginia Tech Multimedia Music Dictionary Composer Biographies. Retrieved August 7, 2007. ↑ Otto Erich Deutsch, "Review of Handel: A Documentary Biography," Music & Letters 36(3) (July 1955): 269-272. At JSTOR (subscription required). Retrieved August 7, 2007. ↑ Edward Hird, "Rediscovering Handel's Messiah," Deep Cove Crier (April 1993). Retrieved August 7, 2007. ↑ Edward Joseph Dent, Handel (Whitefish, MT: Kessinger Publishing, 2004, ISBN 1419122754), p. 63. Frosch, W. A. “The "case" of George Frideric Handel,” New England Journal of Medicine 321 (1989): 765-769. Retrieved August 7, 2007. History of "George Frideric Handel"
This page was last modified on 14 June 2017, at 21:07.